It may have been Annette Daniel Taylor’s booming voice introducing poets coming up to the mic, it may have been the warm red light shining on Julian Montague’s mural (painted by James Moffit), or it may have been the ephemeral poems from Adam Drury’s POEMATIC 900, but if you walked by Washington St. on October 11th, you definitely witnessed some type of magic that transformed an early fall Thursday. 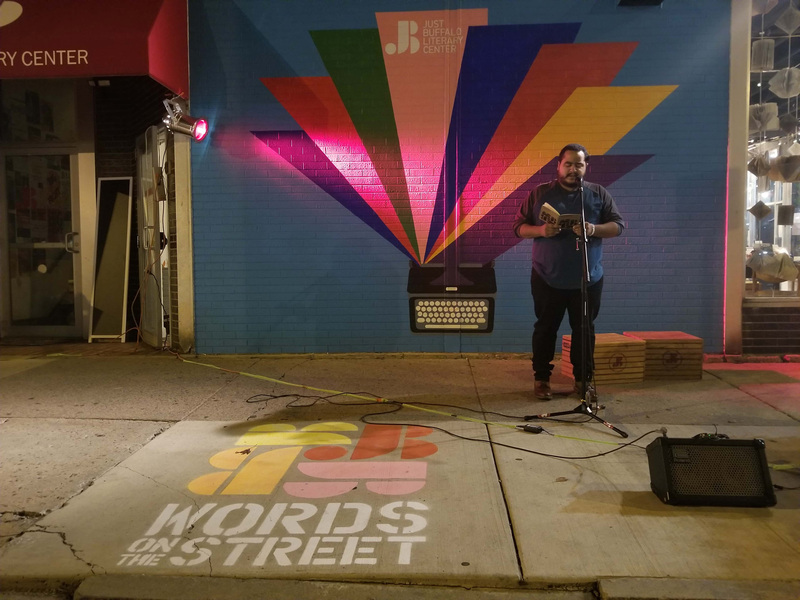 Attendees of Just Buffalo’s Words on the Street Block Party were treated to twelve seemingly different but inextricably connected performances by spoken word poets, musicians, authors, performers, and artists. Taylor, whose unending list of accolades should include Professional Hype-Woman (if it doesn’t already), started off the evening reading from her book, “Dreams on Fire,” recently out from West 44 Books. Set in Buffalo, her novel in verse focuses on a young girl with an incarcerated father. “Good behavior lessens time, not Mama’s tears,” Taylor writes. Following Taylor, we were graced by Richie Willis who shared two poems with the audience about coming out, about having a body, about being a human among other humans. “I did not choose the shape of the constellation that I am,” his voice echoed off the walls and somehow warmed the night around us. Magic. Robin Jordan, Writing Center Coordinator, brought to the stage several Young Writers from the center, names you might not know now but surely you will soon, Jahton, Theo, Hanna, and Angel. These writers aren’t great writers for their ages, they’re just great writers. Addressing issues in their work such as identity, immigration, instability, and the hearts insurmountable ability to heal, these young writers are half reason Mayor Byron Brown designated Washington Street as the literary corridor of Buffalo. Ten Thousand, a member of Buffalo’s Pure Ink Poetry team, delivered another type of magic to the block party by freestyling a poem based on words suggested by the audience. From “puppies,” “obsolete,” “transaction,” and “chicken,” he brought forth a piece about a Grandmother’s love. “Heaven is right here on this plate,” he said. And how right he was. Following Ten Thousand, Curtis Lovell showed us just how many looping harmonies can swirl within one human with songs such as “Tender” and “Bruja.” Lovell’s debut album comes out November 1st, with a show at the 9th Ward. Closing out the night were readings from Laritza Salazar, Julie Valentine, and Dayatra Hassan. Salazar hails from downstate and is currently interning at Just Buffalo. Her magic was found in the line, “a lesson learned from being a childless mother,” which was heard visibly by the audience. Valentine warmed up the chilling night with his blood poems, “sangre para mi” and his joyful descriptions of his Poetry Bus, an on-going project to bring his poems around the country. Lastly, Hassan read her work to us with the voice of a woman who is going to tell you exactly what you need to hear even when you don’t want to hear it. “How it hurts when the truth do it,” she sang out. Her book, “Liberta” can be found on Amazon.